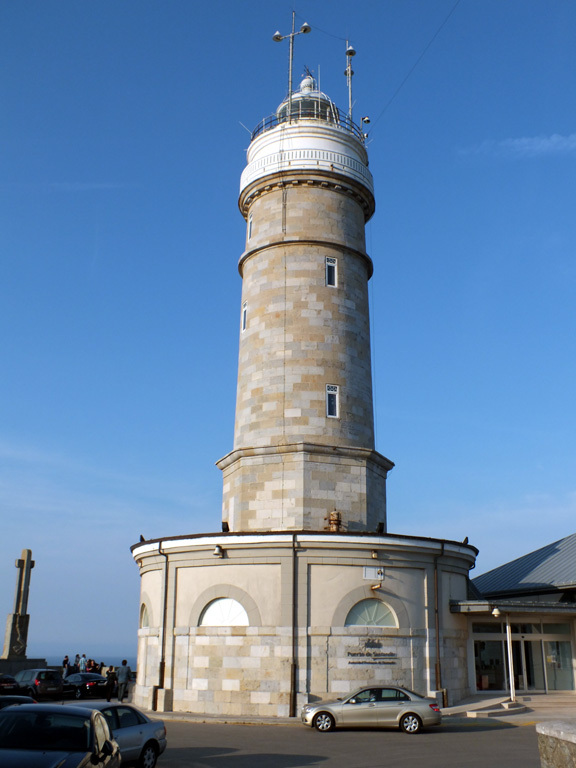 This page lists lighthouses of the central part of Spain's northern coast, including the provinces of Asturias and Cantabria. In general this is a beautiful coastline where mountains drop steeply into the sea, and occasional water gaps create small sheltered harbors. There are also two major ports on this coast, Santander in Cantabria and Gijón in Asturias. 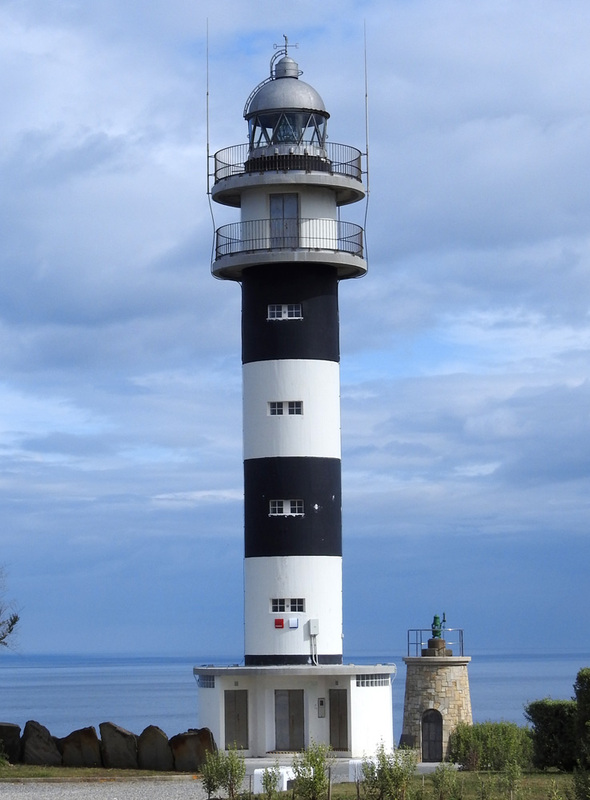 The word for a lighthouse is faro in Spanish and faru in Asturian, but its use is generally restricted to the larger coastal light stations. In Spanish, smaller lighthouses are called balizas (beacons) or farolas. 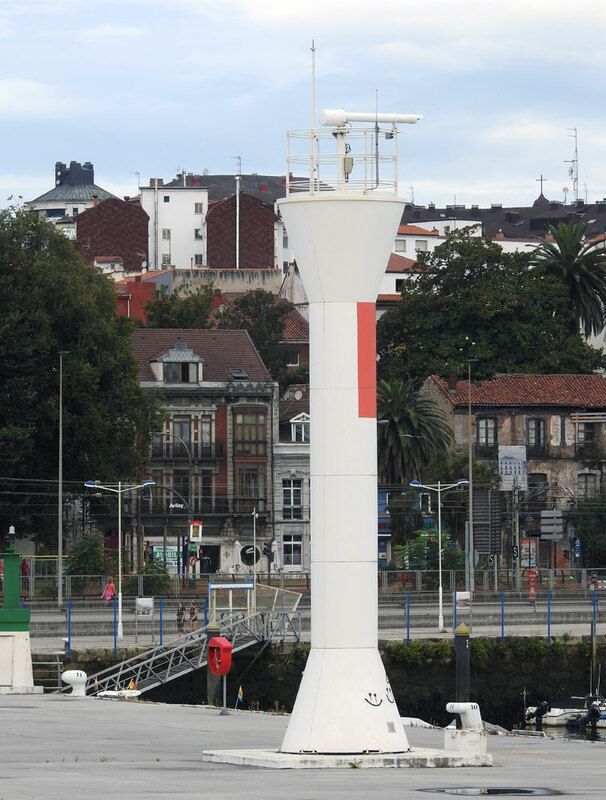 The navigational lights in Spain are the responsibility of the national port authority, Puertos del Estado, but many of them are operated and maintained by regional port authorities. 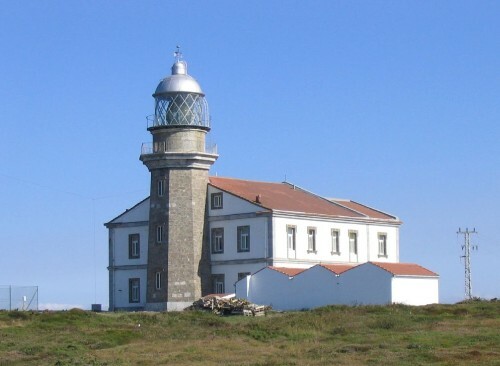 The Comisión de Faros, founded in 1842 to build and maintain Spanish lighthouses, is now an advisory panel. ARLHS numbers are from the ARLHS World List of Lights. ES numbers are from the Spanish national list of lights, Libro de Faros. Admiralty numbers are from volume D of the Admiralty List of Lights & Fog Signals. U.S. NGA List numbers are from Publication 113. 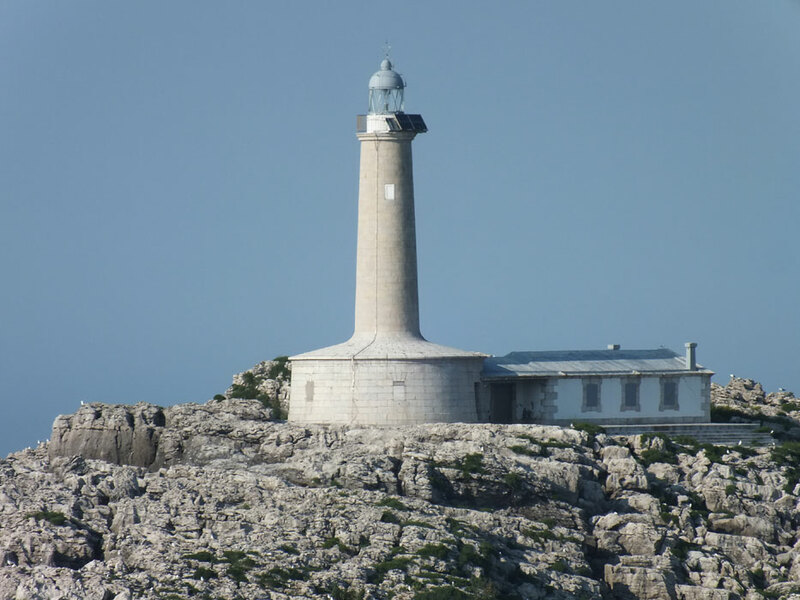 Fact sheets on the major lighthouses, with historical information, posted by the national port authority Puertos de España. Photos by various photographers posted by Alexander Trabas. Many photos from this area are by José da Palma or Arno Siering. Excellent aerial photos posted by Marinas.com. Photos and accounts by Carlos Olmo Bosco. 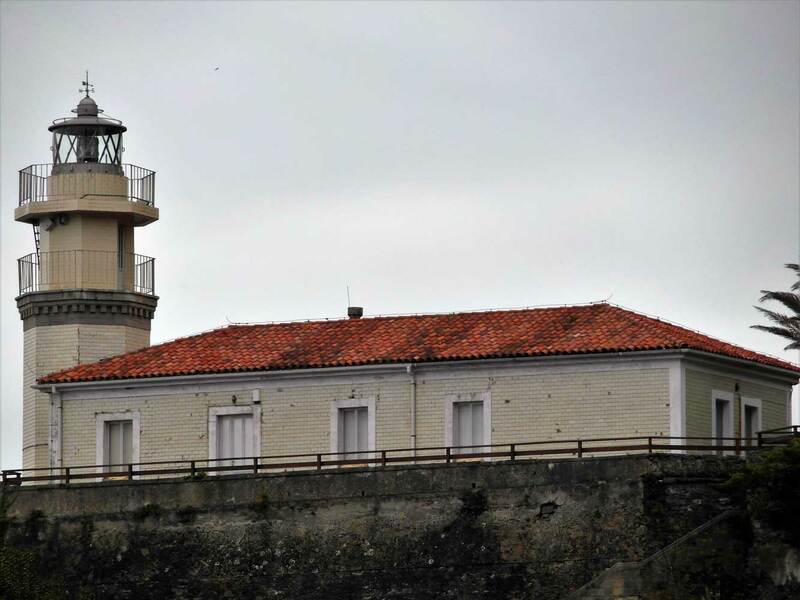 Posted by the Autoridad Portuaria de Santander, this page has small aerial photos of the Cantabrian lighthouses. The page also links to a detailed light list (in .pdf format) that includes small photos. 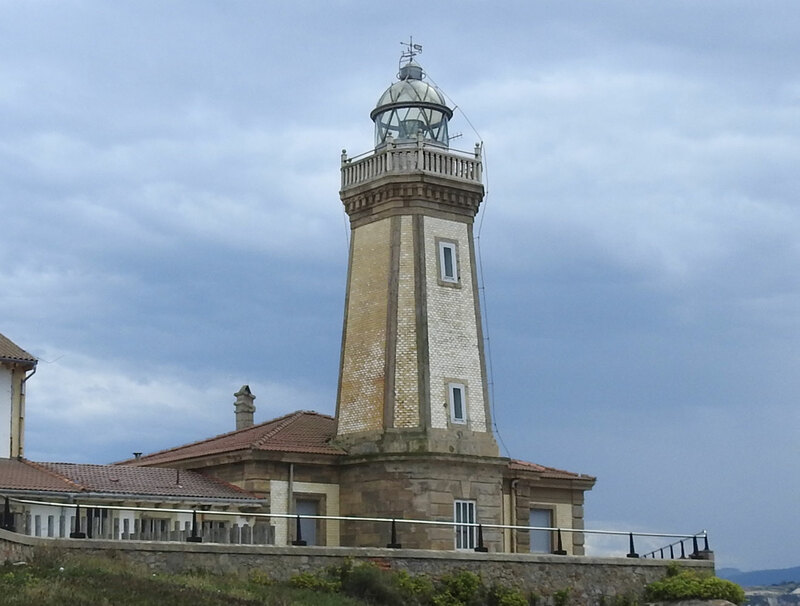 This French-language site by Alain Guyomard and Robert Carceller has pages for many of the lighthouses of northern Spain. Navigational chart information for northern Spain. 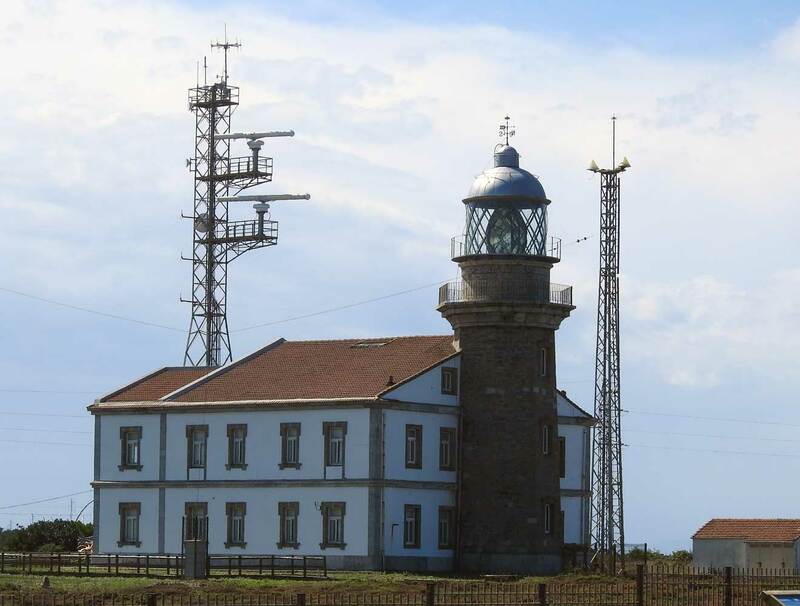 Note: Lighthouses in Asturias west of Cabo Peñas are operated by the Autoridad Portuaria de Avilés. Date unknown. Active; focal plane 18 m (59 ft); four red flashes every 11 s. 7 m (23 ft) post attached to a small 1-story equipment concrete equipment room. Lighthouse painted white. Trabas has a closeup photo, Francisco Javier Martínez Riveiro has a 2017 photo, and Google has a street view and a satellite view. Located on a rocky promontory on the east side of the entrance to Ribadeo, across from the Isla Pancha lighthouses (see Northern Galicia). Site open, tower closed. ARLHS SPA-092; ES-02720; Admiralty D1661; NGA 2341. 1859. Active; focal plane 22 m (72 ft); three white flashes, in a 2+1 pattern, every 19 s. 10 m (33 ft) square cylindrical stone tower with lantern and double gallery, attached to the front of a 1-story keeper's house. Buildings painted white; lantern silvery metallic. Trabas has a photo, Olmo has a good 2007 photo, Wikimedia has a photo by Cayetano Delgado, Higinio Hevia Rodriguez has a distant street view, and Google has a closeup street view and a satellite view. Located on a small island just off the harbor of Tapia de Casariego near the western border of Asturias. The island is connected to the mainland by a jetty, which is closed to the public. Site and tower closed, but there are good views from nearby. ARLHS SPA-160; ES-02700; Admiralty D1658; NGA 2328. 1945. Inactive since 1975. 5.5 m (18 ft) round stone tower with gallery, unpainted. 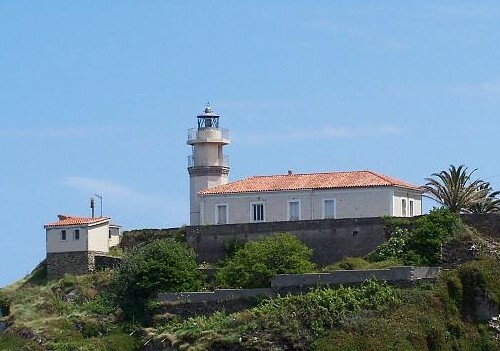 This light is seen to the right of the present lighthouse in Trabas's photo. 1975 (station established 1945). Active; focal plane 70 m (230 ft); white light occulting twice every 12 s. 10 m (33 ft) round cylindrical tower with lantern and double gallery, painted with black and white horizontal bands. Trabas has a good photo, Wikimedia has an excellent photo by Ramón Noriega, Luis Antonio San Millán has a fine street view, and Google has a satellite view. This appears to be one of the modern towers built under the Plan de Señales Marítimas. Located on a headland at the western entrance to the Ría de Navia, about 3 km (2 mi) northwest of the town of Navia. Accessible by road; streetside parking is available. Site open, tower closed. ARLHS SPA-044; ES-02640; Admiralty D1657; NGA 2316. Date unknown. Active; focal plane 24 m (79 ft); three red flashes every 9 s. 14 m (43 ft) unpainted round cylindrical concrete tower. A fragment of a wall suggests that a building was formerly attached to the tower. Trabas has Da Palma's closeup, a more distant view shows the Faro de Luarca in the background, and Google has a street view and a satellite view. 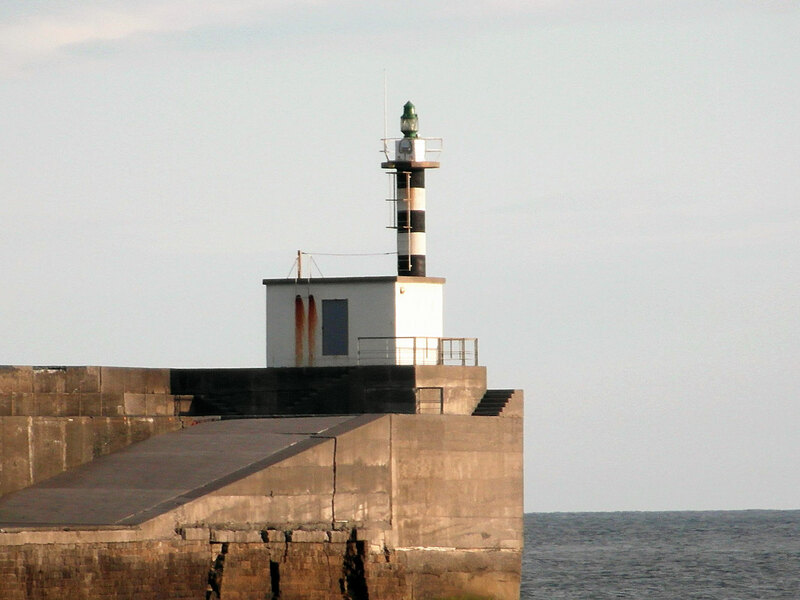 Located at the end of the outer breakwater in Luarca; accessible by walking the breakwater. Site open, tower closed. ARLHS SPA-283; ES-02570; Admiralty D1647; NGA 2292. 1862 (station established 1850). Active; focal plane 63 m (207 ft); white light occulting three times every 15 s. 9 m (30 ft) square cylindrical stone tower with lantern and gallery. Tower painted white with unpainted stone trim; lantern silvery metallic. Fog siren (Morse code "L": one short, one long, two shorts, every 30 s). A photo by Fernando Tomás is at right, Trabas has a good photo, Wikimedia has several photos, another closeup photo is available, and Google has a street view and a satellite view. This lighthouse is within the walls of the Atalaya (Watchtower), a historic walled complex of buildings, some dating to the 14th century. Monks of the monastery here displayed lights for returning sailors in the 16th and 17th centuries. 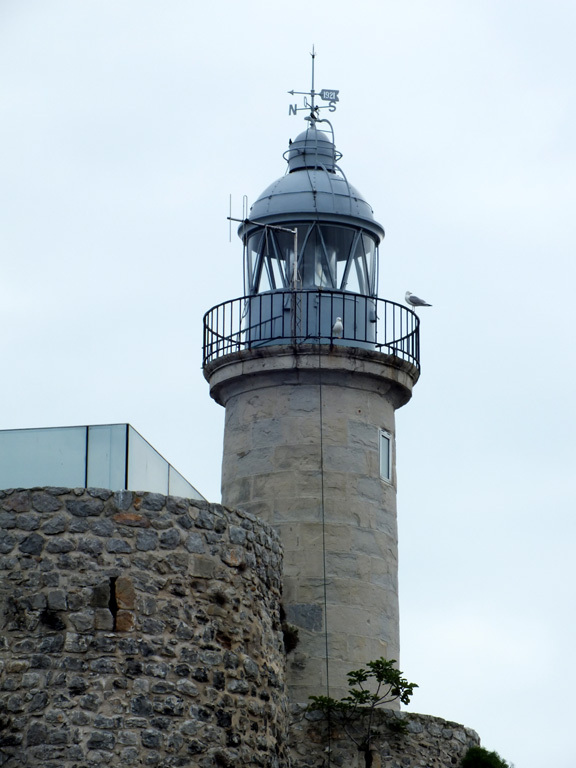 In 1850 a lantern was placed on one of the towers of the complex; this was replaced in 1862 when the current tower was constructed on the wall on the seaward side. Located on the promontory at the eastern entrance to the Ría de Luarca, the open embayment that includes the harbor of Luarca. Accessible by road, but there's no parking close to the tower. Site open, tower closed. ARLHS SPA-193; ES-02550; Admiralty D1646; NGA 2288. 1962 (station established 1858). Active; focal plane 84 m (276 ft); four white flashes every 20 s. 9 m (30 ft) square cylindrical masonry tower with lantern and gallery, rising from the front of a 1-story keeper's house; 3rd order Fresnel lens. Buildings painted white; house has a red tile roof; lantern is all glass including the dome. Trabas has a good photo, Manuel Angel Garcia Villafañe has a 2017 photo, Karlos Chillon has a photo, Marinas.com has aerial photos, and Google has a street view and a satellite view. Cabo Busto is a prominent cape that projects about 3 km (2 mi) into the Atlantic roughly 6 km (4 mi) east of Valdés. Located on the point of the cape. Accessible by road; parking provided. The light station is fenced, but the tiwer can be seen from nearby. Site open, tower closed. ARLHS SPA-008; ES-02530; Admiralty D1642; NGA 2284. 1950. Active; focal plane 101 m (331 ft); white flash every 5 s. 9 m (30 ft) cylindrical stone tower with U-shaped cross-section, lantern and gallery, attached to the front of a 1-story stucco-clad keeper's house. The buildings are unpainted; lantern and gallery painted white. Fog horn (Morse code "V": three shorts followed by one long, every 60 s). Trabas has a closeup, Wikimedia has photos, Saúl Granda has another closeup, Claudia Dal Ceredo has a distant view, Marinas.com has aerial photos, and Google has a street view and a satellite view. Cabo Vidío is a prominent cape that projects about 3 km (2 mi) into the Atlantic roughly 8 km (5 mi) west of Cudillero. Located on the point of the cape. Accessible by road, parking available. Site open, tower closed. ARLHS SPA-055; ES-02510; Admiralty D1641; NGA 2280. 1858. Active; focal plane 44 m (144 ft); white light occulting four time every 16 s. 10 m (33 ft) octagonal masonry tower with lantern and double gallery, attached to the front of a 1-story keeper's house. Tower painted white. Fog horn (Morse code "D": one long, two shorts, every 30 s). A photo by Salvador Mendez is at the top of this page, Trabas has Da Palma's photo, a fine 2007 photo is available, Wikimedia has a view by Ramón Noriega, and Google has a satellite view and a distant street view. This lighthouse has a spectacular site, even by the standards of this coast: it seems almost suspended above the sea. It earns its nickname as El Guardián del Vértigo. Bonfires have been lit at this spot for centuries to aid sailors. 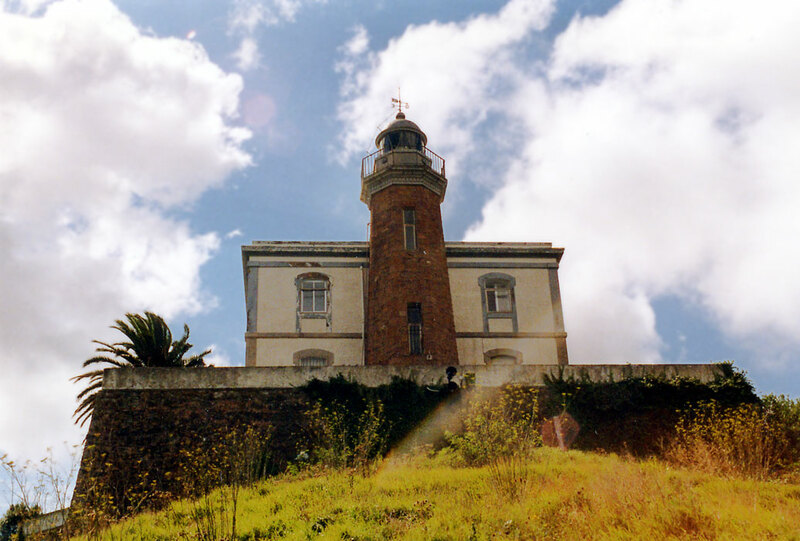 The lighthouse was expanded in 1921 and again in the 1980s as part of the Plan de Señales Marítimas; at that time the tower was heightened with a new lantern and the second gallery. Located atop a vertical headland about 1.5 km (1 mi) north of Cudillero. Accessible by a steep walk up from the Calle Ribera pier. Site open, tower closed. ARLHS SPA-255; ES-02470; Admiralty D1640; NGA 2276. Date unknown. Active; focal plane 19 m (62 ft); two white flashes every 12 s. 8 m (26 ft) post mounted atop a small concrete equipment room. The structure is unpainted. Fog siren (Morse code "N": one long, one short, every 30 s). Trabas has Da Palma's photo, Wikimedia has Ramón Noriega's photo, José Manuel Garcia Gonzalez has a closeup street view, and Google has a satellite view. Located at the end of the breakwater on the west side of the entrance to the Río Nalón at San Esteban de Pravia. Accessible by walking the pier. Site open, tower closed. ARLHS SPA-318; Admiralty ES-02380; Admiralty D1634.2; NGA 2248. 1863. Active; focal plane 40 m (131 ft); white or red light, depending on direction, 3.5 s on, 1.5 s off. 14 m (46 ft) square cylindrical masonry tower with lantern and gallery, attached to the front of a 1-story keeper's house; drum style Fresnel lens. Tower is unpainted brick and stone; lantern silvery metallic. A second, 2-story keeper's house is adjacent. Fog siren (Morse code "A": one short, one long, every 30 s) located 190 m (200 yd) northwest. Capt. Peter Mosselberger's photo is at right, Carlos Olmo has a good photo, Trabas has a closeup, and Google has a street view and a satellite view. The present lantern was installed in 1957. Located at the end of the AS-329 highway, on the north side of the entrance to the harbor of Avilés. Accessible by road, parking provided. Site open, tower closed. ARLHS SPA-128; ES-02100; Admiralty D1630; NGA 2240. 2010. Active; focal plane 12 m (39 ft); white, red or green light depending on direction, 2 s on, 4 s off. 10 m (33 ft) round barbell-shaped white fiberglass tower. Trabas has Da Palma's photo, and Google has a street view and a satellite view. This is a leading light for vessels entering the harbor. Located on the quay at the Centro Niemeyer, the city's cultural center. Site status unknown. ES-02355; Admiralty D1633.35. 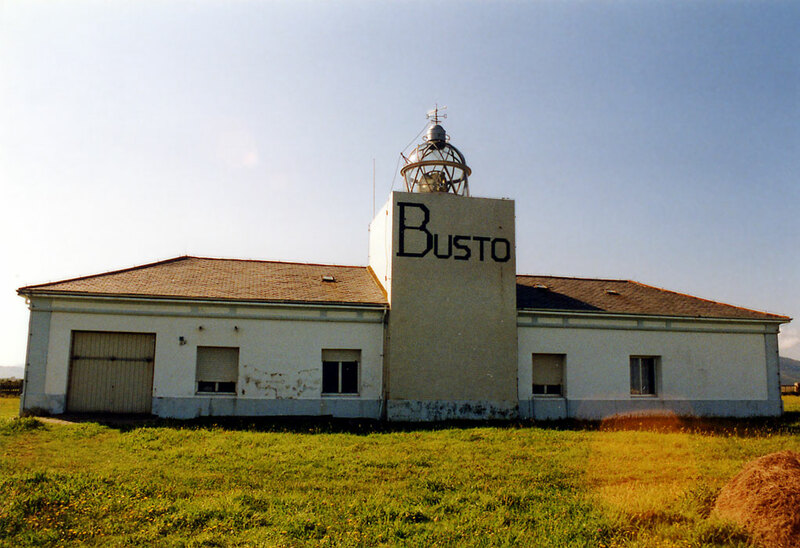 Note: Lighthouses in the Gijón area and the Oriente District are operated by the Autoridad Portuaria de Gijón. 1929 (station established 1852). 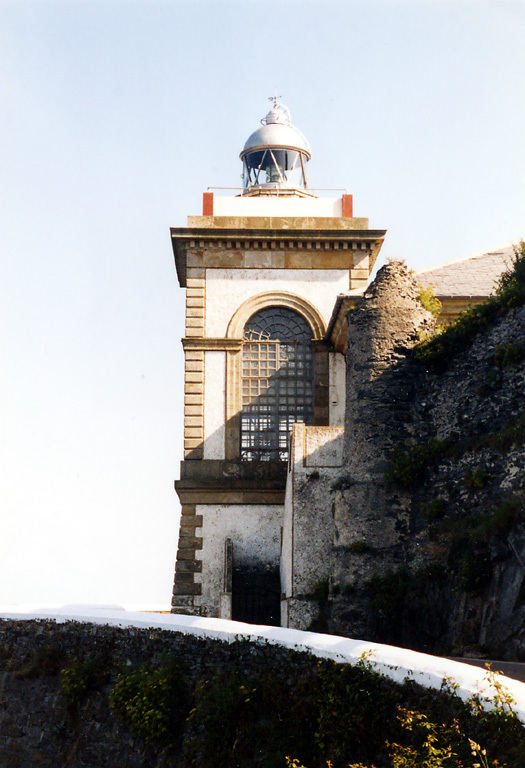 Active; focal plane 117 m (384 ft); three white flashes every 15 s. 18 m (59 ft) octagonal stone tower with lantern and gallery, attached to the front of a 2-story keeper's house; clamshell 1st order Barbier, Bénard and Turenne Fresnel lens transferred from the original lighthouse. Tower is unpainted gray stone; lantern silvery metallic; house painted white with gray trim. Fog horn (Morse code "P": short-long-long-short every 60 s). A photo is at right, Trabas has a great photo, Wikipedia has a good photo by Ramón Noriega, Marinas.com has aerial photos, and Google has a street view and a satellite view. A 1932 photo (bottom of the page) shows both the original and the present lighthouse. 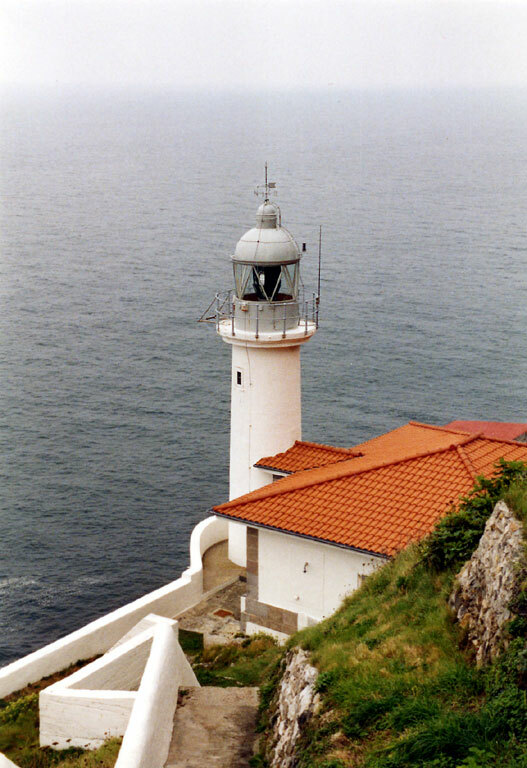 Cabo Peñas, the northernmost point of Asturias, projects across the coastal shipping lanes, making this one of the most important light stations on the northern coast of Spain. The cape is designated a Biological Reserve and also a Protected Landscape (Paisaje Protegido). The lighthouse now houses a maritime museum, the Centro de Interpretación del Medio Marino de Peñas. Located on the heights above the cape, at the end of the AS-328 highway, about 8 km (5 mi) northwest of Gozón. Accessible by road, parking provided. Site open, museum open daily year round, tower status unknown. Site manager: City of Gozón. ARLHS SPA-037; ES-02080; Admiralty D1628; NGA 2236. Date unknown. Inactive since 2013. 1-story stucco-clad farm house with the light displayed through a window in the gable at the seaward end. House painted white. Trabas has a good photo, and Google has a satellite view. 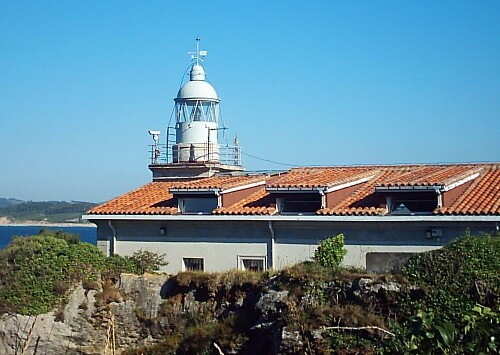 The front light was on the grounds of the Candás lighthouse (next entry). Located above the headland of Punta del Cuerno about 1.2 km (3/4 mi) north of the Carreño waterfront. Site open, tower closed. ex-ES-02031; ex-Admiralty D1616.1; ex-NGA 2216. 1917 (station established 1897). Active; focal plane 40 m (131 ft); white light occulting twice every 10 s. 12 m (39 ft) octagonal stone tower with lantern and gallery, attached to the front of a 2-story keeper's house. Tower is unpainted red-brown stone; lantern silvery metallic; house painted white with gray trim. Fog horn (Morse code "C": long-short-long-short every 60 s). Trabas has a closeup photo, Wikimedia has several photos, José Manuel Fernandez Rancaño also has a closeup, Marinas.com has aerial photos, and Google has a street view and a satellite view. 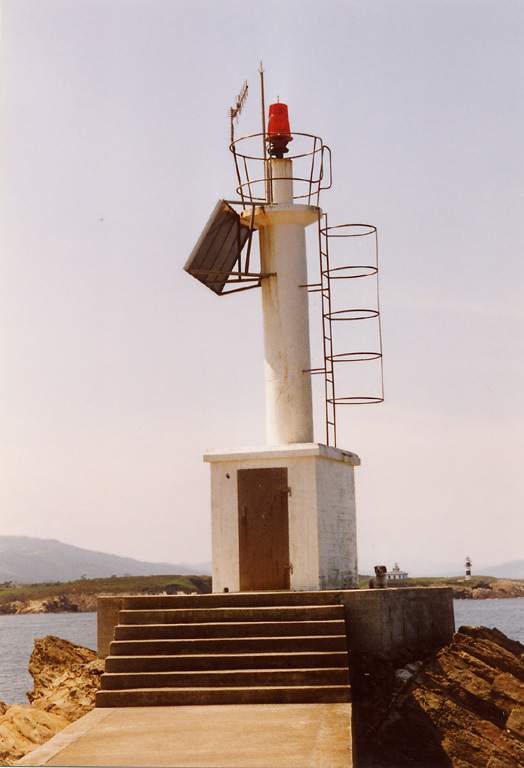 This light marks the entrance to the fishing port of Carreño, which is protected naturally by the steep ridge of the Cabo de San Antonio; a photo shows this well. A temporary light in 1897 was replaced with a more permanent light in 1904, but both proved unsatisfactory. 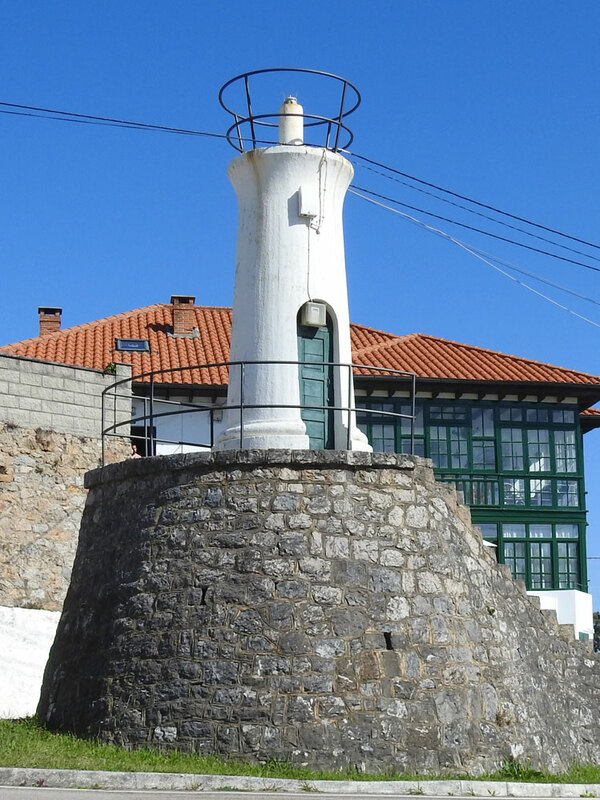 Note: downhill to the northeast of this lighthouse is the front light of the former Punta del Cuerno range (previous entry); it was displayed from a lantern-like structure atop an interesting concrete column. Located on a sharp promontory about 1 km (0.6 mi) northeast of the Carreño waterfront. Accessible by road, parking available. Site open, tower closed. ES-02020; Admiralty D1614; NGA 2208. 1924 (station established 1865). Active; focal plane 82 m (269 ft); two white flashes every 10 s. 12 m (39 ft) octagonal masonry tower with lantern and gallery, attached to the front of a large 2-story keeper's complex. Entire building painted white; lantern dome painted red. Trabas has Da Palma's photo, Wikimedia has several photos, Alfredo Garcia has a closeup street view, and Google has a satellite view. This lighthouse replaced a 9 m (30 ft) masonry tower. Located on a sharp headland marking the western entrance to the harbor of Gijón. Accessible by hiking the service road about 1.2 km (3/4 mi) to the lighthouse; parking is provided at the start of the hike. Site open, tower closed. ARLHS SPA-023; ES-01750; Admiralty D1596; NGA 2204. 1864 (may have been rebuilt in the 1920s). 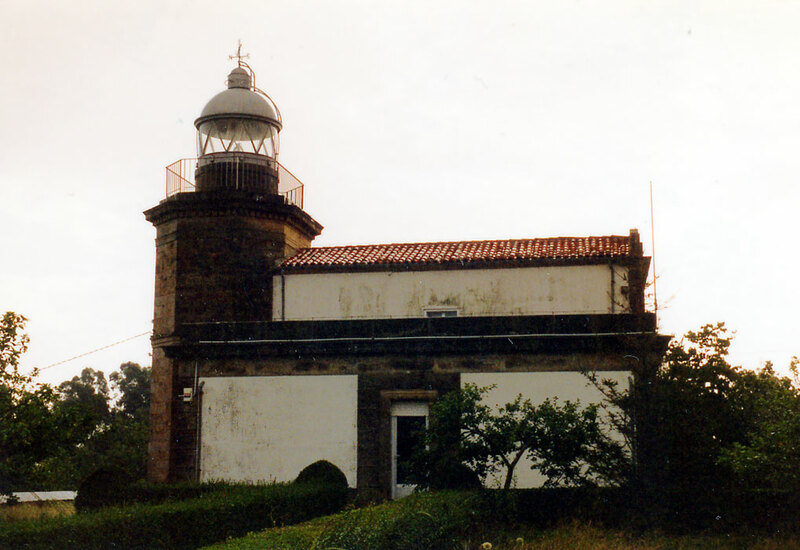 Active; focal plane 127 m (417 ft); white flash every 7.5 s. 11 m (36 ft) octagonal cylindrical stone tower with lantern and gallery, attached to the seaward side of a 2-story masonry keeper's house. Tower is unpainted stone; lantern dome is silvery metallic; house painted white with unpainted stone trim and a red tile roof. Ramón Noriega's photo is at right, Trabas has a closeup photo, Manuel Hernández Lafuente has a 2017 photo, Marinas.com has aerial photos, and Google has a street view and a satellite view. Fog horn (three short blasts followed by one long blast every 30 s). The original light had a focal plane of 67 m (220 ft). In 2007 the lighthouse was transferred to a local group with plans to establish a cultural center and natural history museum in the building. However, this does not seem to have happened. Located on a headland about 9 km (5.5 mi) northeast of Villaviciosa and 28 km (18 mi) east of Gijón. Accessible by road (some local knowledge may be needed), but parking is limited. Site open, tower closed. ARLHS SPA-137; ES-01720; Admiralty D1592; NGA 2132. 1993. Active; focal plane 118 m (387 ft); five white flashes, separated by 3.2 s, every 30 s. 18 m (59 ft) cylindrical concrete tower with lantern and gallery, rising from the center of a 1-story masonry equipment building. Lighthouse painted white with black trim; lantern dome painted green. Olmo has a good photo, Trabas has a closeup photo, Wikimedia has Ramón Noriega's photo, another photo is available, and Google has a street view and a satellite view. 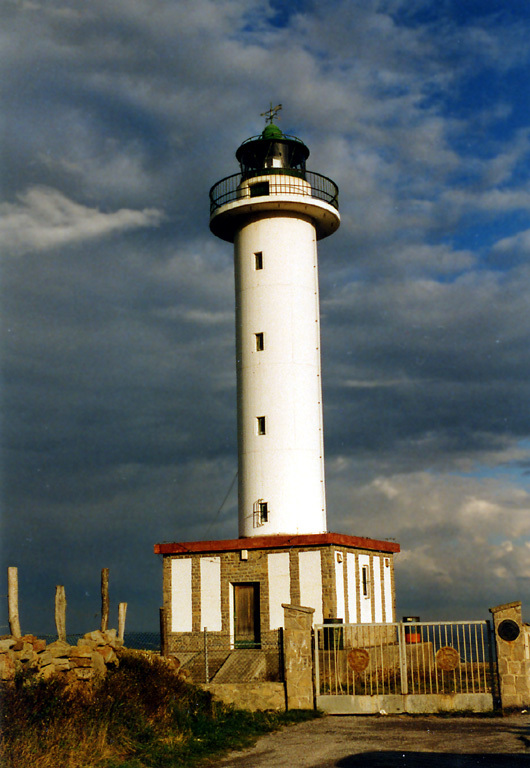 This is one of the new lighthouses of the Plan de Señales Marítimas 1985-89, although its construction lagged somewhat. Located atop a steep headland about 6 km (4 mi) north of Colunga and 40 km (25 mi) east of Gijón. Accessible by back roads (follow signs), parking provided. Site open, tower closed. ARLHS SPA-053; ES-01680; Admiralty D1591; NGA 2130. 1861. Active; focal plane 115 m (377 ft); three white flashes, in a 1+2 pattern, every 12 s. 8 m (26 ft) square masonry tower with lantern and gallery, attached to the front of a 1-story masonry keeper's house. Building painted white with unpainted stone trim; lantern dome is silvery metallic. 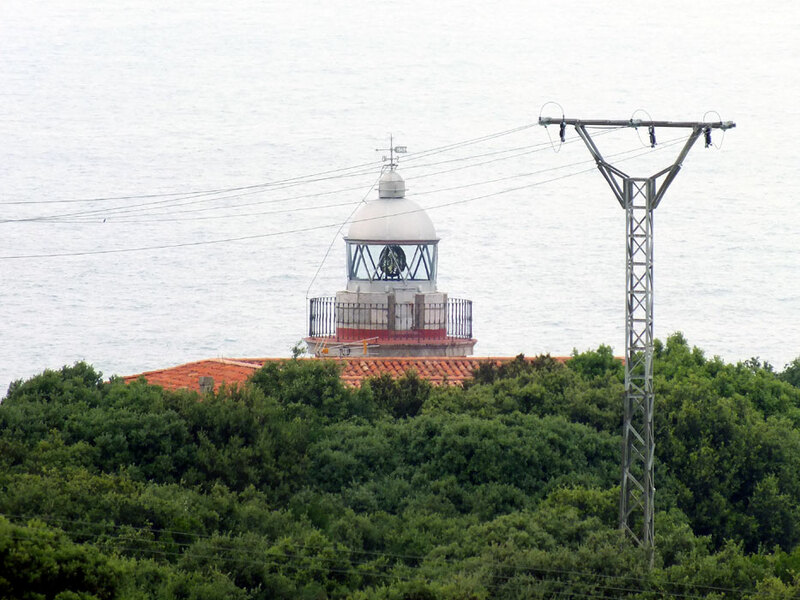 Trabas has a photo, Wikimedia has Ramón Noriega's photo, and Google has a satellite view, but the lighthouse is mostly hidden by vegetation in Google's street view. Located on a headland about 1 km (0.6 mi) west of the Ría de Ribadesella. Accessible by road, but the entrance is gated. Site open, tower closed. ARLHS SPA-275; ES-01660; Admiralty D1586; NGA 2120. Date unknown. Active; focal plane 12 m (39 ft); two red flashes every 6 s. 8 m (26 ft) round cylindrical concrete tower with a small gallery. The tower is unpainted white concrete with trim painted red. Trabas has Siering's photo, Wikimedia has a closeup photo, another closeup is available, and Google has a satellite view. Huelse has a historic postcard view of the original lighthouse, an octagonal tower. Located at the end of the seawall on the east side of the entrance to the Ría de Ribadesella. Accesssible by walking the waterfront (about 500 m (3/8 mi) from waterfront parking). Site open, tower closed. ES-01670; Admiralty D1587; NGA 2124. 1961 (station established 1860). Active; focal plane 18 m (59 ft); white light occulting four times every 15 s. 8 m (26 ft) octagonal cylindrical masonry tower with lantern and gallery, attached to the front of a 2-story masonry keeper's house. Building painted white with a dark green tile roof; lantern dome is silvery metallic. Trabas has Siering's photo, Wikimedia has Ramón Noriega's view from the sea, another view from the sea is available, Huelse has a historic postcard view, and Google has a fine street view and a satellite view. The original lighthouse, heavily damaged by fire in 1946, was replaced by a temporary tower in 1950. Located directly on the waterfront in Llanes, a small fishing port about halfway between Santander and Gijón. Streetside parking is limited. Site open, tower closed. ARLHS SPA-319; ES-01640; Admiralty D1582; NGA 2116. 1864. Active; focal plane 68 m (223 ft); white flash every 5 s. 9 m (30 ft) cylindrical masonry tower with lantern and gallery, attached to the front of a 1-story masonry keeper's house. Building painted white with a red tile roof; lantern dome is silvery metallic. 4th order Fresnel lens in use. Ramón Noriega's photo is at right, Trabas has Siering's photo, André Winter has a photo, Marinas.com has aerial photos, and Google has a satellite view. Located atop a spectacular 60 m (200 ft) vertical cliff about 7 km (4.5 mi) north of Ribadedeva in easternmost Asturias. Accessible by a challenging road through the mountains. 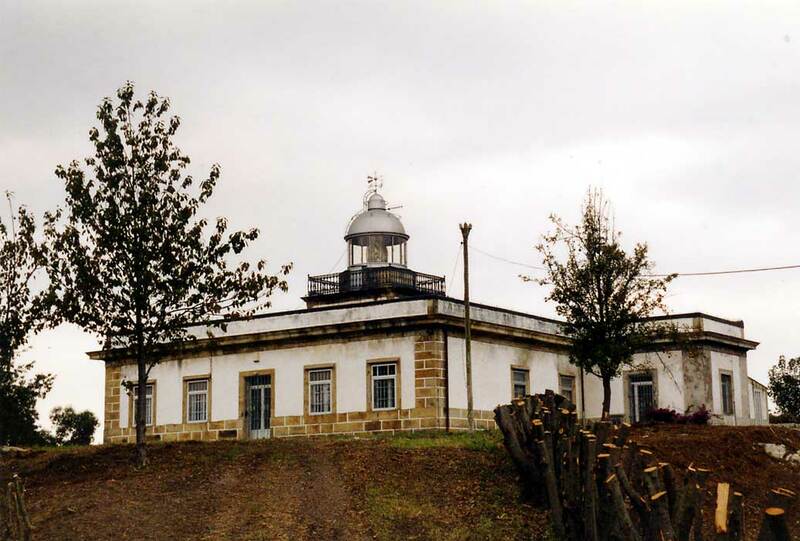 Site and tower closed (gated entrance) but Winter reports the lighthouse can be seen from a popular lookout, the Mirador Pimiango. ARLHS SPA-218; ES-01620; Admiralty D1580; NGA 2112. 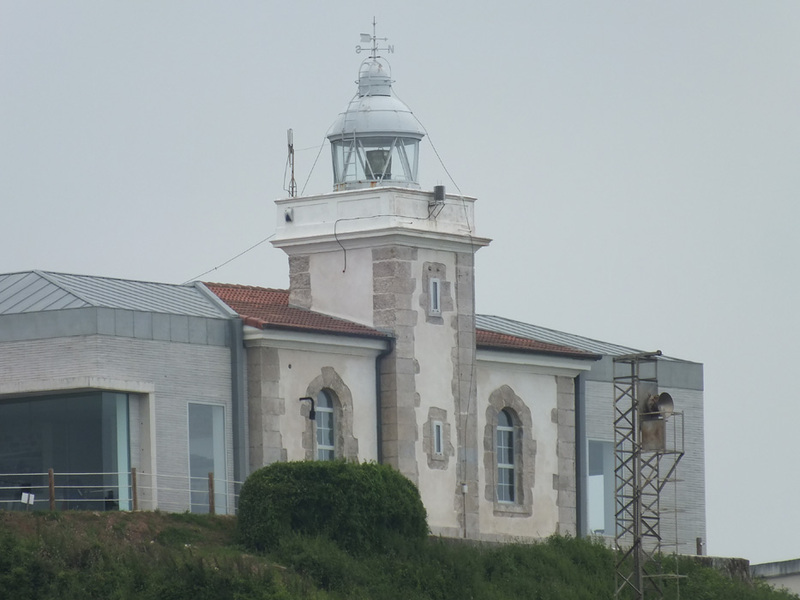 Note: Lighthouses in Cantabria are operated by the Autoridad Portuaria de Santander. 1871. Active; focal plane 43 m (141 ft); white light, 2.5 s on, 1 s off. 9 m (30 ft) square cylindrical stone tower with lantern and gallery, attached to the front of a 1-story masonry keeper's house. Lighthouse painted white with unpainted stone trim; lantern is gray metallic. Fog horn (Morse code "V", three shorts and one long, every 30 s). Trabas has Siering's photo, Francisco García Hernández has another photo, Marinas.com has aerial photos, and Google has a street view and a satellite view. 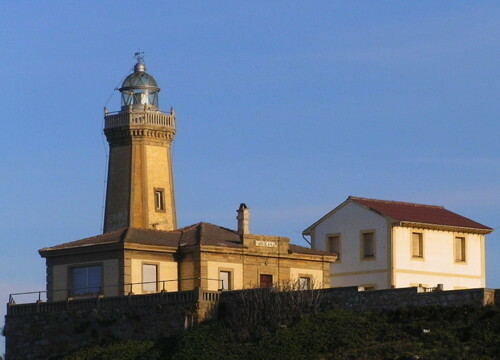 In June 2005, the city of San Vicente de la Barquera leased the lighthouse for renovation as a maritime museum. The museum opened in summer 2009. Located atop a bluff on the west side of the entrance to the harbor of San Vicente de la Barquera. Site open, museum open, tower status unknown. Site manager: Museo Artesanal y Costumbrista del Mar. ARLHS SPA-266; ES-01570; Admiralty D1574; NGA 2096. Date unknown. Active; focal plane 20 m (66 ft); red flash every 3 s. 7 m (23 ft) round concrete post mounted on a round solid stone base; a stairway gives access to the light. Light tower painted white with a narrow black vertical stripe; base unpainted. Trabas has Siering's closeup photo, and Google has a street view and a satellite view. 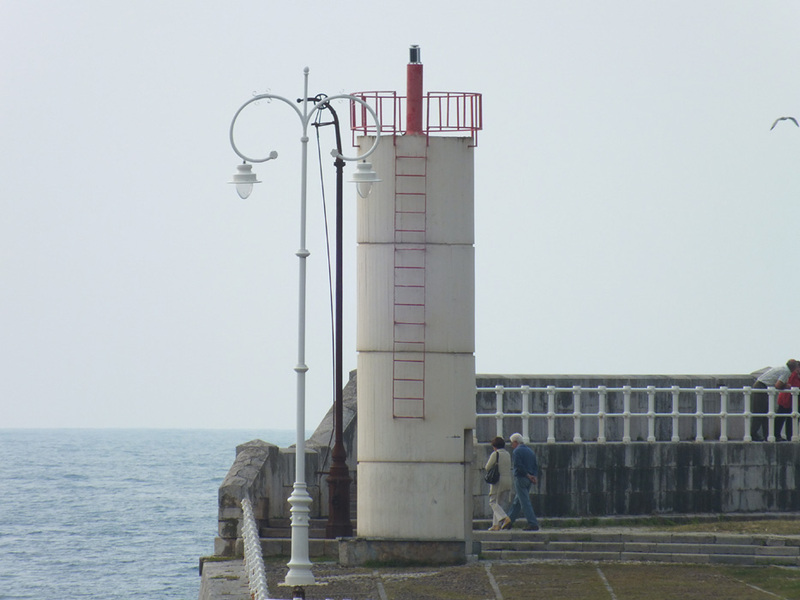 This is one of four similar small range lights in Comillas, but the only one with a stone base. 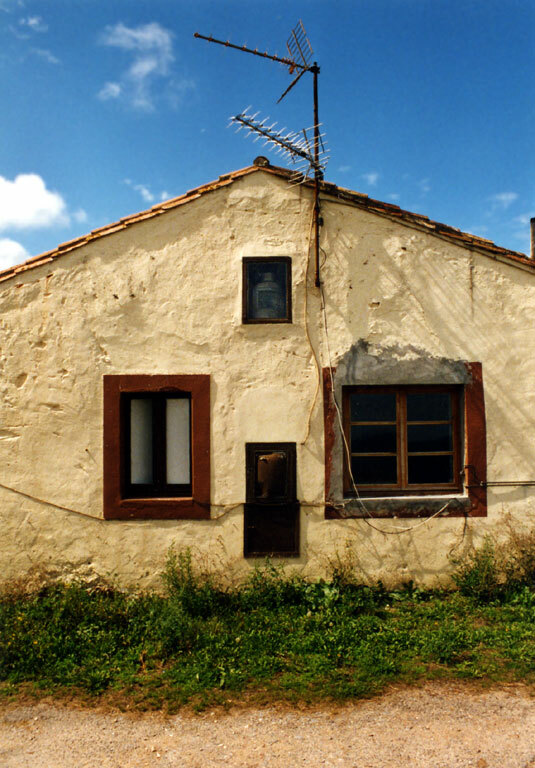 Located in a street intersection at the foot of the Calle de Juan Martínez in Comillas. Site open, and visitors can climb the stairs to the base of the light tower. ES-01531; Admiralty D1568.1; NGA 2088. 1863. Active; focal plane 35 m (115 ft); three white flashes, in a 2+1 pattern, every 24 s. 9 m (30 ft) cylindrical masonry tower with lantern and gallery, attached to the front of a 1-story masonry keeper's house. Lighthouse is unpainted stone (formerly painted white); gallery painted white; lantern dome is gray metallic. Javier Habladorcito's photo is at right, Trabas has a good photo by Arno Siering, Javier Morillas has a closeup photo, Wikimedia has a distant view by Alfonso Benayas, Marinas.com has aerial photos, Huelse has a historic postcard view, and Google has a street view and a satellite view. 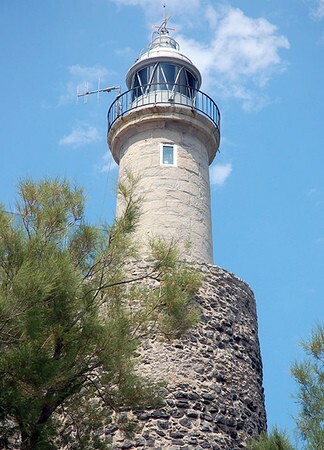 This lighthouse is built on the site of the medieval fortress of San Martín de la Arena. The original lantern and Fresnel lens were replaced in the 1980s with a modern lantern and a rotating aerobeacon. More recently the station has been demoted to minor status and the aerobeacon has been removed, leaving an empty lantern; the light is now shown from a small lens mounted on the gallery rail. Located at the tip of a peninsula projecting into the sea about 2.5 km (1.5 mi) north of Suances. Accessible by road, parking provided. Site open, tower closed. ARLHS SPA-269; ES-01485; Admiralty D1562; NGA 2064. 1839. Active; focal plane 89 m (292 ft); two white flashes every 10 s. 30 m (98 ft) stone tower with lantern and gallery rising from the center of a circular 1-story stone keeper's house; an additional 1-story house is attached. 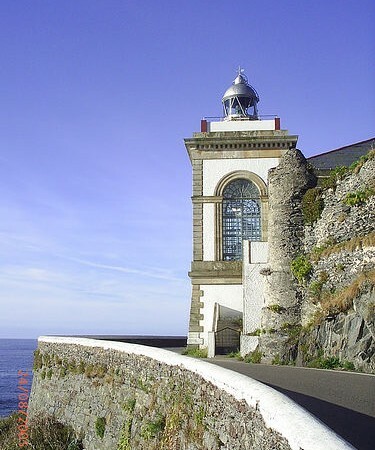 Lighthouse is unpainted stone; gallery painted white; lantern dome is gray metallic. Fog horn (two 3.5 s blasts every 40 s). Tiia Monto's photo is at right, Wikimedia has several photos, Lighthouse Digest has a good photo by José Manuel, Trabas has Siering's closeup photo, Marinas.com has aerial photos, Huelse has a historic postcard view, and Google has a street view and a fine satellite view. 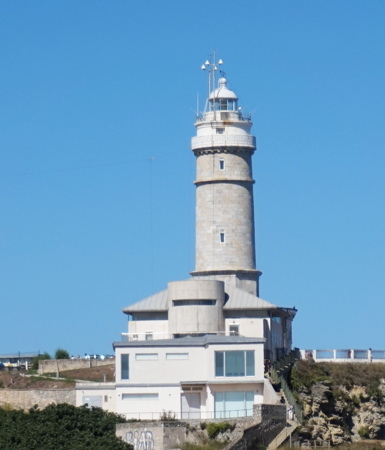 This historic lighthouse was built in response to a royal order of 1833; originally it was part of a fortress that supported the defense of the royal naval base in Santander. Well maintained, it is a popular tourist attraction adjacent to the city's Parque Cabo Mayor. 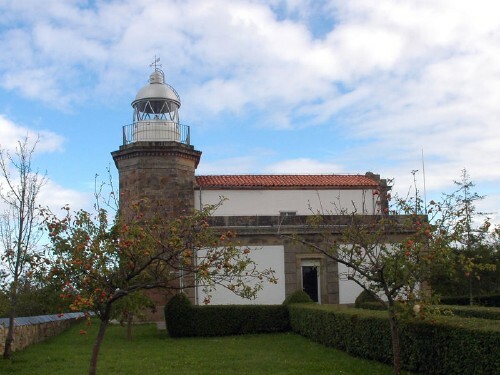 The keeper's houses have been renovated as an art museum exhibiting lighthouse-related works, many by the local painter Eduardo Sanz-Villar. 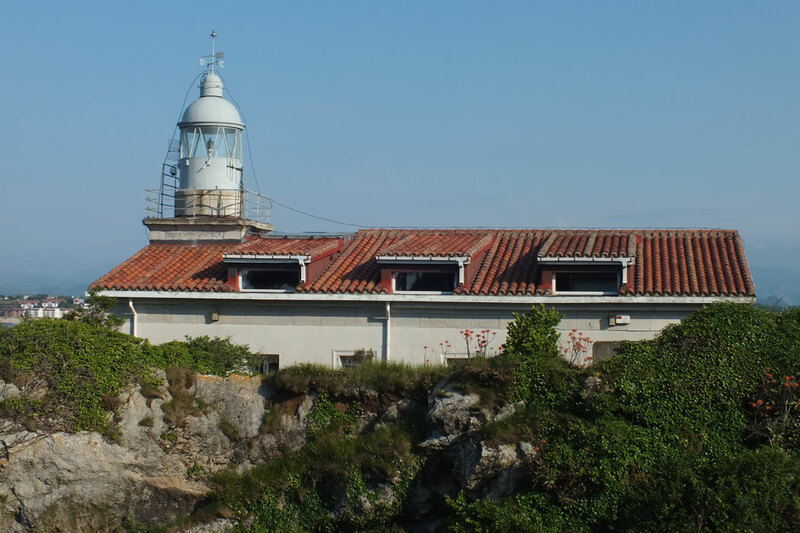 Located on a headland projecting into the sea about 5 km (3 mi) northwest of the Faro de la Cerda and the same distance northeast of the Santander waterfront. Site open daily, museum open daily except Mondays, tower closed except by prior arrangement with the caretakers on duty. Site manager: Centro de Arte Faro Cabo Mayor. ARLHS SPA-033; ES-01140; Admiralty D1561; NGA 2060. 1870. Active; focal plane 24 m (79 ft); five white flashes, in a 1+4 pattern, every 20 s. 9 m (30 ft) square cylindrical masonry tower with lantern and gallery rising from the front of a large 1-story keeper's house complex. Building painted white with unpainted gray stone trim; lantern is gray metallic. A photo is at the top of this page, Trabas has Siering's closeup, Guyomard and Carceller also have a photo, Wikimedia has several photos, Huelse has a historic postcard view, and Google has a street view and a satellite view. 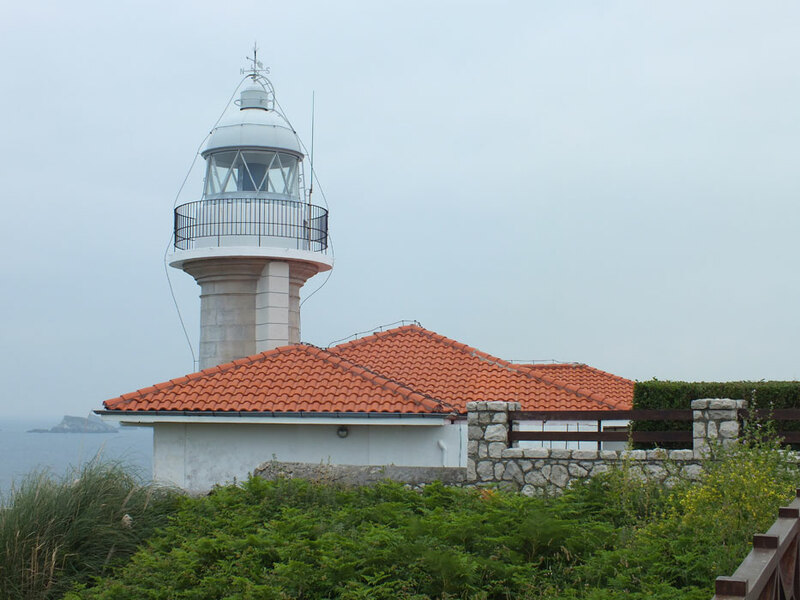 The lighthouse is built on the site of the fortress of Santa Cruz de la Cerda, which protected the harbor of Santander in medieval times. 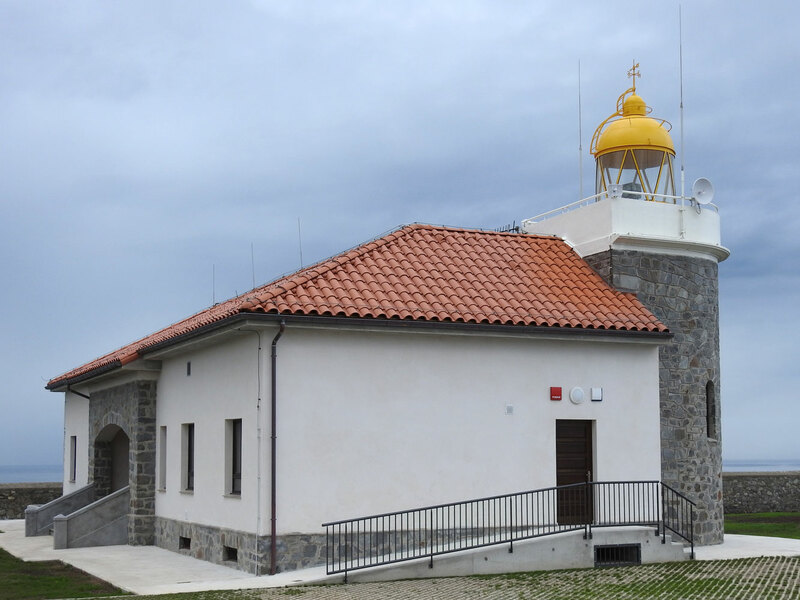 The port authority has renovated the lighthouse, and it now serves as the Aula del Mar (Classroom of the Sea), an environmental education facility operated jointly by the Universidad de Cantabria and the Universidad Internacional Menéndez y Pelayo. Located at the eastern tip of the Península de la Magdalena, guarding the west side of the entrance to the Bahía de Santander. The peninsula is a city park that also features the 19th century summer palace of King Alfonso XIII. Accessible by road, but parking is limited. Site and building open, tower status unknown. Site manager: Ciudad de Santander. ARLHS SPA-170; ES-01160; Admiralty D1556; ex-NGA 2024. 1860. Active; focal plane 39 m (128 ft); three white flashes every 21 s. 20 m (66 ft) stone tower with lantern and gallery rising from the center of a circular 1-story stone keeper's house; an additional 1-story house is attached. Lighthouse is unpainted stone; lantern is gray metallic. Trabas has Siering's photo, Lighthouse Digest has a photo of the island and lighthouse by José Manuel Sobrao, Wikimedia has several photos, Marinas.com has aerial photos, and Google has a satellite view. This highly exposed lighthouse was a dangerous assignment for keepers; one was drowned by a great wave in 1865. As recently as February 1996 a severe storm swept over the tower and extinguished the light. The original lantern was removed around 1990. 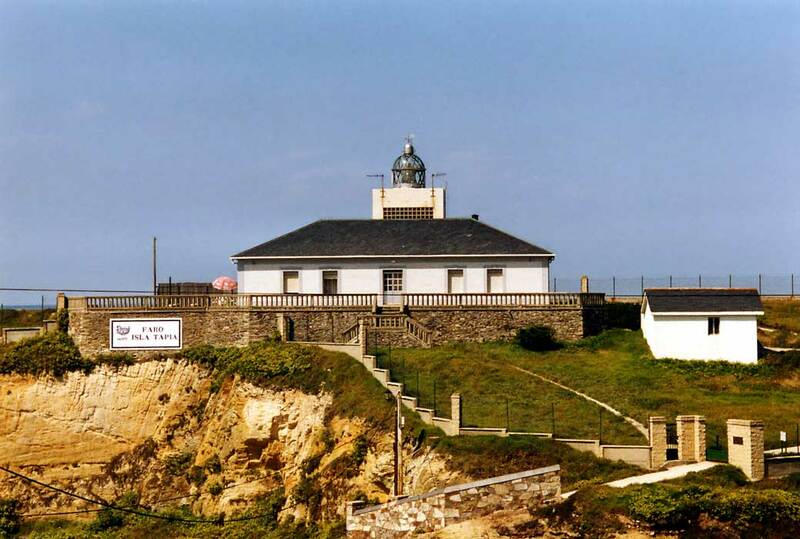 In 2003-04, the port authority spent €130,000 restoring the lighthouse, including installation of a new lantern by helicopter in April 2004. Located on a small island in the mouth of the Bahía de Santander. Accessible only by boat, and the island is a restricted nature reserve. Site and tower closed, but there is a good view from the Palacio de la Magdalena in Santander. ARLHS SPA-153; ES-01150; Admiralty D1554; NGA 2020. 1985 (station established 1930s?). Active; focal plane 71 m (233 ft); white light occulting three times (2 s each) every 16 s. 14 m (46 ft) cylindrical concrete tower with lantern and double gallery, rising from a circular 1-story base. 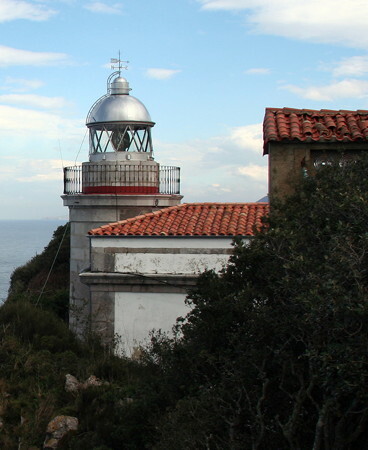 Lighthouse painted white; lantern dome is gray metallic. A 2007 photo is available, Trabas has Siering's photo, Wikimedia has several photos, and Google has a satellite view and a distant street view. 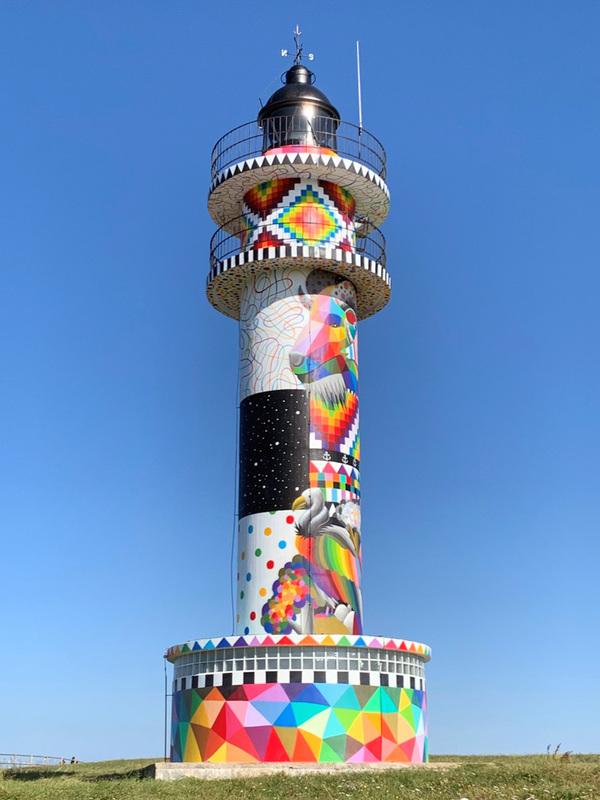 This handsome modern tower, designed by Fernando Rodríguez Pérez, was one of the first new lighthouses built under the Plan de Señales Marítimas 1985-89. Located at the northernmost point of the Cantabrian coastline, at the end of the Barrio del Faro (CA 446) about 8 km (5 mi) north of Ajo. Site and tower closed, but the lighthouse can be seen from a distance. ARLHS SPA-005; ES-01130; Admiralty D1552; NGA 2016. 1864. Active; focal plane 39 m (128 ft); four white flashes in a 3+1 pattern every 18 s. 13 m (43 ft) masonry tower attached to a 1-story keeper's house. Entire lighthouse painted white. A photo is at right, Trabas has a good photo, Olmo also has a photo, Maria Jose Ruiz has a 2018 closeup photo, André Winter has photos, and Google has a distant satellite view. This light station has been modified extensively and it is not clear how much remains of the original. The station was rebuilt after being heavily damaged by a storm on February 23, 1915. The keeper's house was apparently replaced by a smaller and more modern structure around 1930. 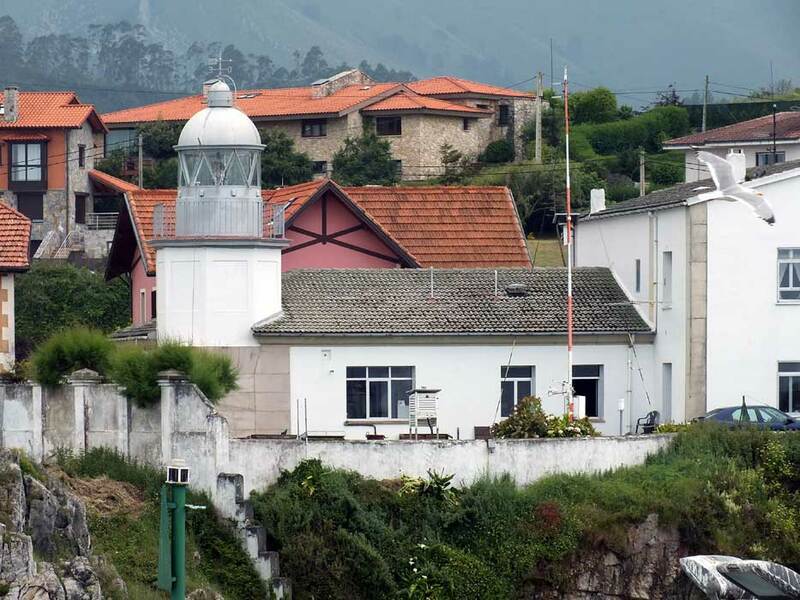 In June 2005 the city of Santoña leased the light as a tourist attraction; the plan was to improve the road to the lighthouse and open the keeper's house for overnight accommodations, but so far this has not occurred. Like Punta del Caballo, the light station is notched into the side of steep mountain, but in this case there is road access. Located on a north-facing headland about 4 km (2.5 mi) north of Santoña and only about 2 km (1.25 mi) northwest of Punta del Caballo. Accessible by hiking the access road about 2.5 km (1.5 mi) from a poorly-marked entrance. There's no parking at the trailhead but parking is available at a beach at the foot of the mountain. Site open, tower closed. ARLHS SPA-227; ES-01010; Admiralty D1542; NGA 1984. 1863. Inactive since the mid 1990s. 8 m (26 ft) cylindrical stone tower with lantern and gallery, originally painted white. The 2-story keeper's house has been demolished. 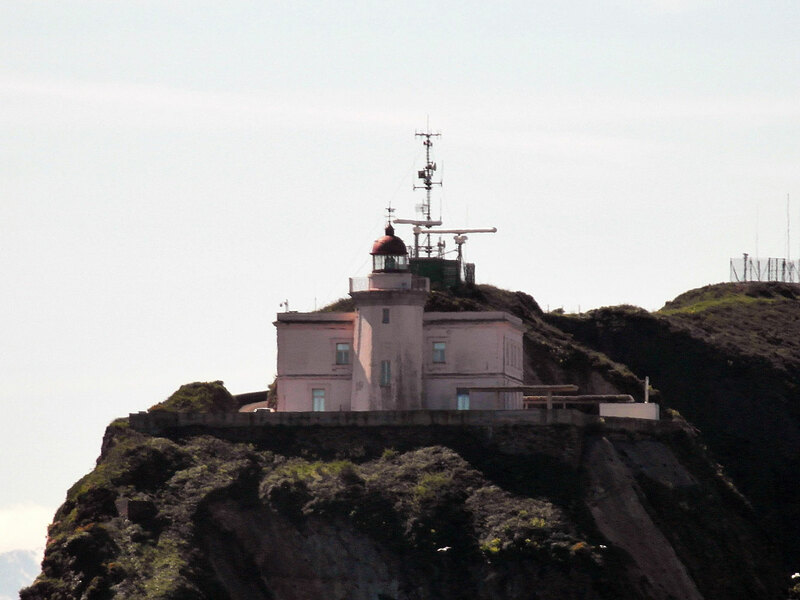 Ixone Ruiz has a 2018 photo, another 2018 photo is available, Wikimedia has a view from below by Raúl Hernández González, Huelse has a historic postcard view of the lighthouse and keeper's house, and Google has an indistinct satellite view. 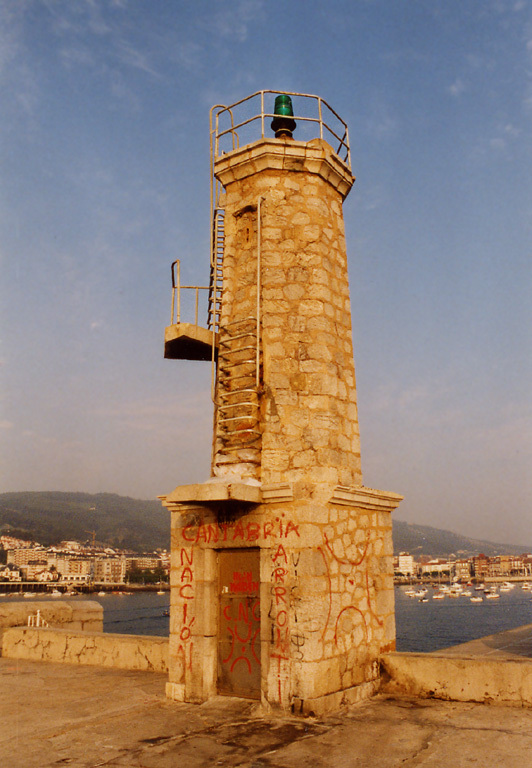 This lighthouse was built in a notch cut in the side of Monte Buciero, a near-vertical mountainside. 682 steps, a very challenging descent, lead down to the lighthouse. 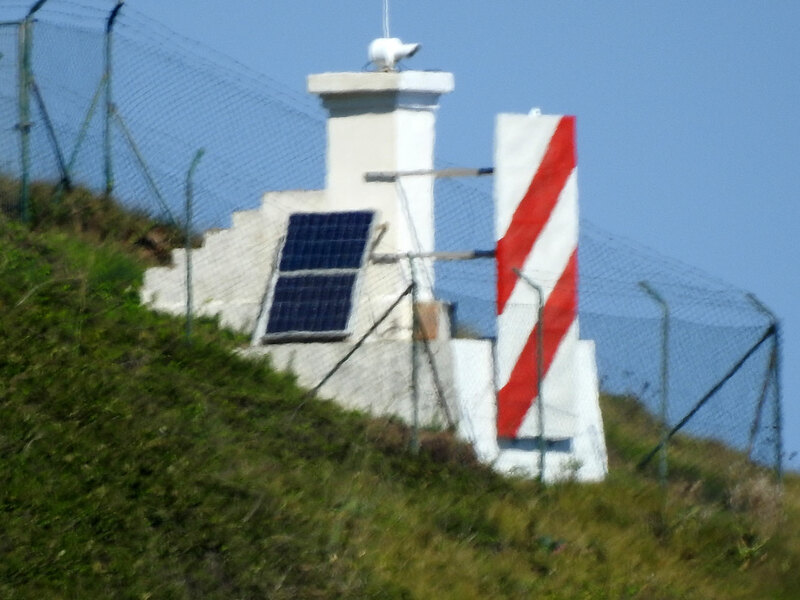 After automation, the isolated lighthouse was repeatedly vandalized. 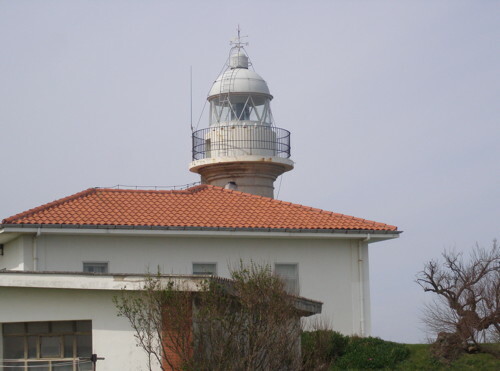 Its deactivation was the result of this problem, the difficulties of the site, and the close proximity of the Faro del Pescador (previous entry). Located on an east-facing headland on the north side of the entrance to the Ría de Treto and the harbor of Santoña. André Winter found the site to be accessible by a popular and well-marked (but somewhat vertiginous) hiking trail from the Punta del Pescador. Site open, and it appears that the tower is open. ARLHS SPA-196; ex-Admiralty D1544. 1853. Active; focal plane 49 m (161 ft); four white flashes every 24 s. 16 m (52 ft) stone tower with lantern and gallery, attached to one corner of a massive stone castle. The upper portion of the tower is painted white; lantern dome is gray metallic. 1-story keeper's house built atop the castle. Fog siren (Morse code "C" (long-short-long-short) every 60 s.) Jesús Romero's photo is at right, Trabas has a closeup photo by Siering, Wikimedia has several photos, Huelse has a historic postcard view, and Google has a street view and a satellite view. The lighthouse has been renovated several times; the present lantern is at least the third. The fog siren was added in 1953. The castle and the adjacent church of Santa Maria de la Asunción are among the oldest and best known Gothic buildings of the province; they are believed to date from the 13th century. The peninsula on which they stand provides natural shelter for a small harbor used by fishermen for many centuries. 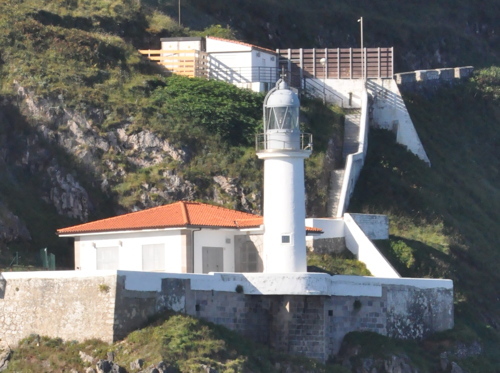 Located atop a vertical cliff at the point of the peninsula in Castro-Urdiales. Site open, tower closed. ARLHS SPA-066; ES-00970; Admiralty D1536; NGA 1964. Date unknown. Active; focal plane 14 m (46 ft); green flash every 3 s. 7 m (23 ft) octagonal stone tower centered on a square 1-story stone equipment room. The lighthouse is unpainted. Trabas has a closeup photo, Jason Burton has a street view, and Google has a satellite view. 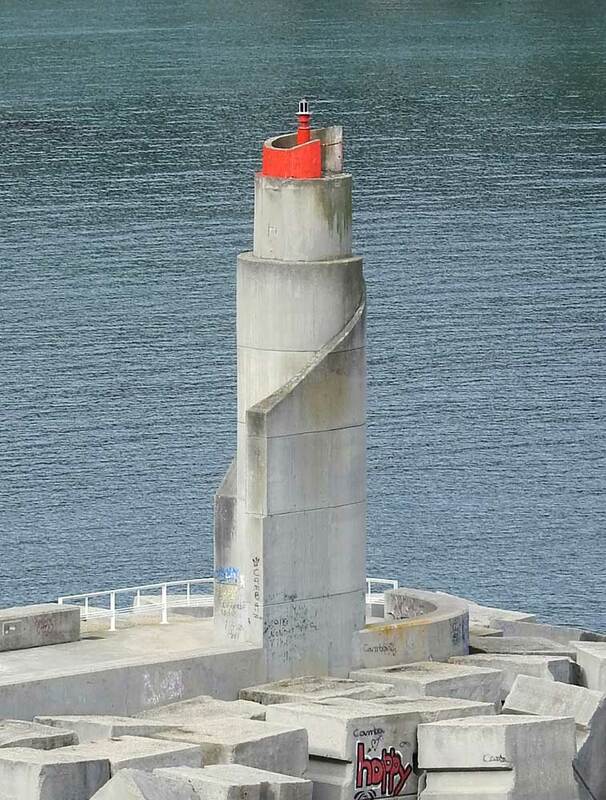 Located at the end of the main (north) breakwater of Castro-Urdiales. Accessible by walking the pier. Site open, tower closed. ES-00980; Admiralty D1537; NGA 1972. Posted November 18, 2005. Checked and revised February 17, 2019. Lighthouses: 33. Site copyright 2019 Russ Rowlett and the University of North Carolina at Chapel Hill.